We all have them, that favorite shirt or favorite pair of pants. We know we wear them often hoping others don't notice but they really do. With me it's colored T-Shirts and black pants. A friend of mine recently lost her mother and she loved two pair of pants that were her favorite. There were so many that wanted to share in the memories. 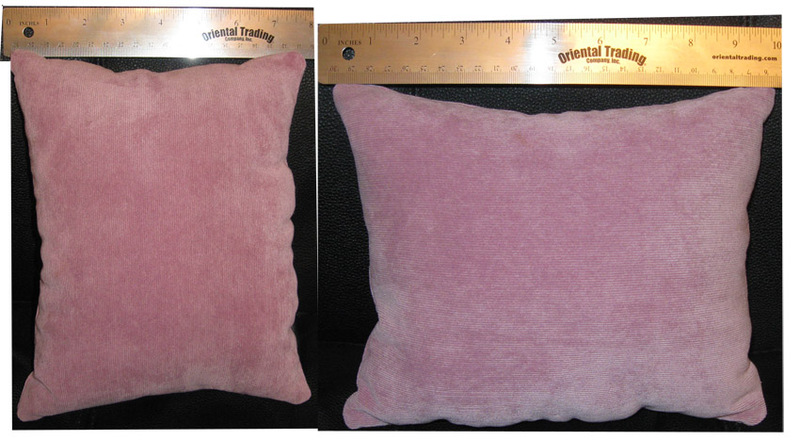 Thus, how about a small 8x10 pillow? It can be used as a neck pillow or just to hug from time to time to bring the memories back. Out of one pair of pants, I was able to create 6 pillows. Obviously, depends on sizing. I carefully cut out the sized squares trying to avoid the side seams since they are pretty thick. I added a 1/4 seam around the pillows right sides of fabric facing each other. I left about a 3" opening for turning. I then went down to the serger and serged all the seams as well for strength. I carefully turned the pillows right side out and stuffed and stuffed with pillow stuffing. I hand sewed the opening closed and there I had it. The softest rose corduroy comfort pillow. I am so happy they are turning out well for my friend.